The QA360 MOD is a mass production version of the QA360LE, It's circuit and material and QA360LE is exactly the same, only the production process will be different. It is based on the QA360 with improvementon the sound. The QA360 MOD's sound of approaching a limited edition (limited edition can at least reach 97% of the sound quality is generally not AB will be obvious). Compared to the QA360, it’s quite obvious that that the QA360 MOD is able to produce a noticeably cleaner and more textured sub bass. QA360 MOD is have a more thicker warm mids, and more precise's Imaging, and a more background's dark, has a great sense of impact and musicality, and more retrieval of details . Our target: “Perfectly and accurately recovery for the music recordings, and deep dark background”. QA360 MOD implemented QLS-HiFi’s unique proprietary technology �C the single threaded software framework. This technology ensured ultra-low jitters and high accuracy in playback of digital music by occupying the whole CPU with the single music reading and decoding program during the music playback.We keep it simple as always for supporting the simplest SD media cards only, however on the other hand we make every attempt to improve the back end qualities so providing the best value to againstthe priceto the true audiophiles. QA360 MOD is the continuing persistence in pursuit of our belief on HiFi equipment development. QA360 MOD supports Studio Master wav files in 24Bit / 192KHz and DSD64 / 1Bit / Stereo. DSD files can be streamed out of the digital output in DoP format, and hardware converted to analog singles directly through the internal DAC as well. Three Low jitter TCXO for PCM & DSD. Use PGA2311 for Advanced digital volume control. SDHC / SDXC Supports up to 256GB with FAT32. MENU: English、Simplified Chinese 、Chinese Traditional. Support: 16Bit / 24Bit, 44.1-192Khz, DSD 1Bit 64FS. WAV 16 / 24Bit, 44.1~192 kHz. AIFF 16 / 24Bit, 44.1~192 kHz. FLAC 16 / 24Bit, 44.1 kHz~48 kHz, compression level 0~8. APE 16Bit, 44.1 kHz, compression level fast and normal. MP3 16Bit, 44.1 / 48 kHz, 96k bps~320k bps, CBR / VBR / ABR encoding. CUE ANSI / UNICODE / UTF-8 Encoding. DSD DSD64 1Bit, Stereo---DIFF、DSF、SACD ISO. 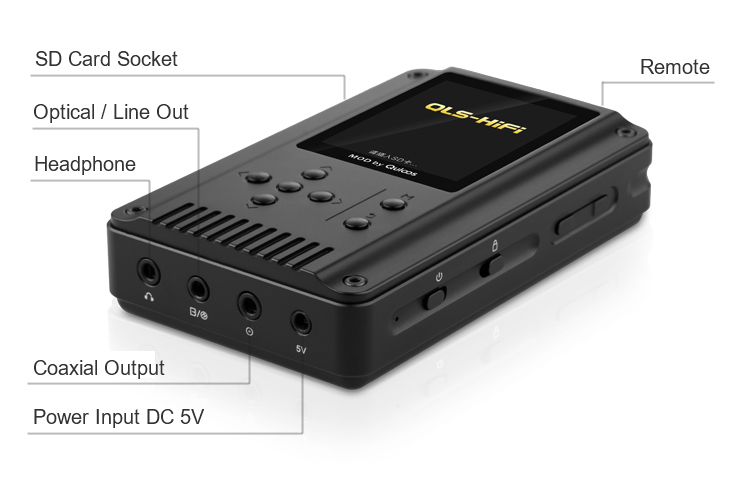 Digital output: PCM / Dolby Digital output / DTS Digital output / DSD (DoP V1.0). Battery life: 10 to 11 hours for PCM, Or 7-8 hours for DSD. Tip: The beneficiary name should be TANG YAN , Not is QLS Electronics. After payment,please e-mail us the your recipient name、 recipient address、zip Code、contact phone number. You can select the nearest agency for westernunion, you only need my name, city and country to send money. They accept cash and online payment .After you send it, the workers of westernunion will give you a control number, i need this control number and your full name to draw money. With more than 150 years of experience, Western Union is a global leader in money transfer services. It helps consumers and businesses send money quickly and reliably,only take 5 minutes to arrive.you can visit www.westernunion.com for more details.Also it is easy to find a close agent from this link: http://www.westernunion.com/info/selectCountry.asp and please click Find An Agent . After payment,please e-mail us The Sender's First Name, Last Name, Total Amount, Money Control Transfer Number and address on the payment sheet, so that we can track and get the payment. Also Please tell to us the your recipient name、 recipient address、zip Code、 contact phone number.